Decorating a porch door and frame that were in a sorry state. This door and frame was just a small piece of the project. It was part of a complete lounge repaint. The paintwork to this interior face of the porch door was in poor condition due to general age and, also due to a lovely big Weimaraner dog scratching to follow her owner. The door was given a good rub down using Oakey abrasive 60 grade (I didn’t use Abranet abrasives at the time) and then vacuumed off. The woodwork was then cleaned down using sugar soap and rinsed clean. All dents and dings were filled with a two pack wood filler and rubbed down smooth using Oakey abrasives (80 grit). Bring out the Zinsser Cover Stain. Now to get some paint on. Using the brilliant oil borne primer sealer called Zinsser Cover Stain, which sticks like (you know) to the proverbial nappy. This paint has many uses and one of them, I find, is to help build out some of the unevenness of the surface. Cover Stain can be over painted with either a water borne or oil borne paint of your choice. I prefer water borne paints. One coat of the Cover Stain was applied to the wood trim and allowed to dry fully for one hour. The Cover Stain rubs down to a lovely smooth finish when using Oakey finishing paper 180 grit. Another vaccuum over the surface has it ready for the next applications. Bring out the Crown Trade Interior Acrylic Gloss. 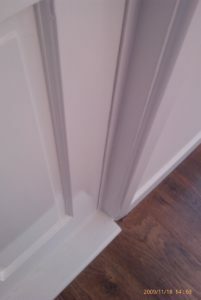 Two full coats of Crown Trade interior acrylic gloss – brilliant white are applied. This time, rubbing down with a Scotch-Brite pad between coats. Brush of choice: Wooster 2″ Ultra Pro Firm. Now, some decorators say that waterbased paint doesn’t provide an adequate sheen level compared to an oil based paint. Well this is true. But I do know that the Crown interior acrylic gloss has been more than acceptable to all my past clients where I have recommended it. You can see for yourself in the photo’s that it has a very good sheen level. I can also say that it holds it whiteness for at least 5 years unlike the current oil based paints of today (since 2010). I have since started trialling Johnstone’s Aqua range of undercoat and gloss. Now this gloss has some serious shine for a water based paint. However, I do not personally know how long it holds it’s whiteness. There are a number of decorators who are now using this paint over at Painters Pit Stop decorating forum. We are all sharing our views and experiences with this new(ish) water based gloss. Update Jan 2019 – The chat on Painters Pit Stop Forum currently (as of Jan 2019 as I write), are that the Johnstone’s Aqua range ruins your brushes. For us pro’s, that is a right pain in rear as our brushes are good brushes and not cheap.